Christmas time is fast approaching and a change in season with colder weather can ignite stress. For many of us, the festivities can be busy and challenging. It may feel as though there are not enough hours in the day. Meditation practices for the festive season can certainly help. It’s important to remember that the body needs time to rest and recover to avoid getting ill. Try to take deep breaths regularly, nourish the body with seasonal and healthy food to combat the odd mince pie or chocolate!. Self-love means making time for you. 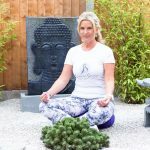 I would like to share 3 meditative practices for the Festive Season to help you cope. This restorative yoga pose allows you to experience a physical shape that slowly unwinds tension. When you settle into supported child’s pose – you have an opportunity to cultivate calm. This restorative form may encourage you to slip into silence, soften your senses, and relax. If you regulate your breathing patterns and learn to quiet an overactive mind, you can help to feel so much calmer and relieve stress. If you repeat a sound, word or phrase this can become your mantra. The vibration of Om – pronounced AUM. Invite Om to join your breath: on the inhale, feel your breath move in through your nose. Feel the vibration in your body and then allow Om to ride the length of your exhale. The Metta meditation is a technique to focus your attention and give the mind a rest. Metta meditation promotes feelings of loving-kindness, compassion and love. Begin by inviting in several deep breaths. Repeat this mantra over and over, until these words permeate you. And then, when you’re ready, expand that loving-kindness to include others. At first, you may expand to loved ones, but eventually, expand to people and situations that cause stress, and ultimately to all beings everywhere. Practice as often as you can, even if only for a minute at a time. Our future is created by choices we make every minute. If you would like to learn more about mindfulness or meditation then contact us at Lifestyle Studio to book a FREE place on Tuesday 8th January at 10.45am – 11.30am.